Good day everyone. First of all I would like to express my appreciation for the invitation to attend this EA Global. It's my second event, and it's really been great to see the growth of this movement, and the people that it brings together. I'm really happy, honored, and privileged to be addressing you here today. However I think I'm afraid I have to start with a confession of sorts, maybe even two. The first one is that the title of my presentation is a ruse. It's a ploy. I'm not going to give you tips or hands-on advice on how to be amazingly effective in the world of policy making. I think it's probably contraspecific anyway, and I'm happy to discuss it later. But it's a ruse for a good purpose. 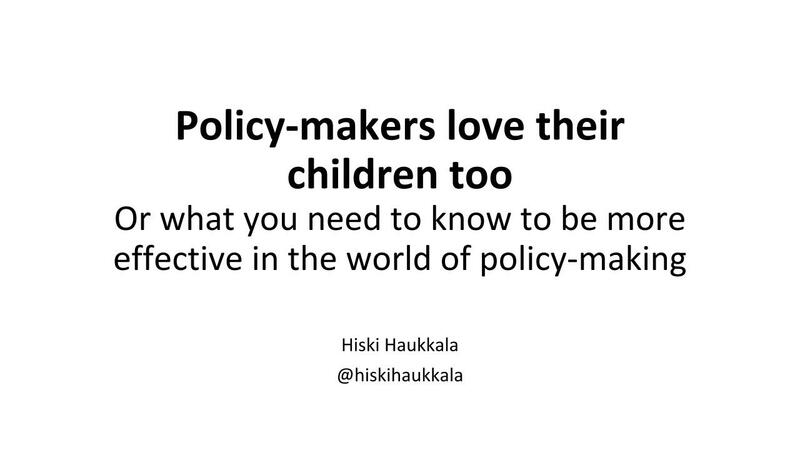 I have a bigger fish to fry and I hope and almost semi-promise that I will get to the point that you probably were expecting, at the very end of my talk. The second confession is this: it's not aspirational, like "I have a dream." It's more bit of a letdown like "I used to believe." But I think it's still powerful and important and something that deserves our consideration. Because what I used to believe is that we can bypass the problems of state-centric governance and devise working solutions to the pressing problems of our age, including that of the future. I was an optimist for quite some time. I thought that, and I think I was seeing through my own scholarship and reading a lot of literature, that power was diffusing. It was going away from states and formal, old structures. But it wasn't clearly going necessarily anywhere, at least at first. It gave me this hope that we could build different forms of new regulation, spontaneous orders, and social movements like effective altruism, to generate the positive outcomes that we need. For me, for quite some time, the world seemed awash with feasible alternatives. But unfortunately I do not fully believe this to be the case anymore. The reason is that the change we so desperately require simply doesn't come fast enough. We see the paralysis of existing forms of governance to a certain extent, and I will say a few words about that, but we are not seeing massively and sufficiently effective forms of new governance coming instead. The clock is, unfortunately, ticking. Yet quitting is not an option. The stakes are simply too high. We have been talking about these new issues, new problems, new forms of threats, x-risks, catastrophic risks. We have been talking about climate change and so on and so forth. These are all things that desperately require our attention and creative working solutions. The conclusion that I have drawn from all of this, my past five years working for the government and witnessing international cooperation firsthand and the attempts, however feeble and at times fallible in terms of developing international governance, is that we actually have a massive amount of existing structures and mechanisms and things in place that we need to improve. So basically, even though I used to believe something that was aspirational and I think is still worth our consideration, and working towards, I'm more convinced, at least for the time being, that we actually also have to steer some of our energies into getting things done here and now, using the mechanisms and levers we already have in place. This means engaging many of the structures that perhaps you, through your own work, feel a certain level of aversion or distrust towards. What I want to try to do here today is to make a case and argue that perhaps some of these things deserve a second thought, and more importantly deserve the kind of inputs that only people like you can give. What ails us? What is the problem and what is the issue that is bringing us down and keeping us from achieving the results that we so badly need? Well this is the bit of good news that I have. Leaders that I have met, and I have actually met quite a few during my career, are on average both intelligent and ethically high level. Not all of them, without naming any names, absolutely not naming any names, but intelligent and ethically high level. I'm fully convinced that they genuinely want to make the world a better place. This is the feeling that I've gotten from watching leaders in action, from basically all corners of the earth. These people have basic capabilities and aspirations, which have motivated them into entering the game of politics, and to become policy makers or even political leaders. Yet they keep making decisions that are detrimental to our long-term well-being. This is a clear paradox. Why are we not getting the kind of results that we would like to have, and need to have, even though, on principle at least, the people are of the right caliber and quality, and have the best interests of their nations, but also of humanity, at heart? Well, this is a 20 minute talk. What I'm going to go through next is a seminar series lasting for six months, but I'll try to give a quick run through some of the problems of our, in particular, western liberal democracies. These leaders are, to a large degree, constrained by vested interests. There are all kinds of interest groups, industries, trade unions. All kinds of peoples with specific needs, and there are vested interests that are working very hard and at cross purposes, to retain or enhance these very sectoral specific interests. By doing so they in fact create policy paralysis, incompatible agendas, and create very difficult situations for political leaders, who in the final analysis are always looking for re-election, which is another factor that challenges this system. This results in short-termism, overall erosion of our democratic systems, which is visible in many of our countries today. We are living in a world that equates leadership with populism, where leaders are usually putting out their antennae, and trying to listen to the signals from the electorate. What does the electorate want? What are the vested special interests that they should cater to? They focus on this, instead of providing us with long-term thinking and solutions. This is compounded with information overload, which I can testify as a former civil servant is massive in terms of the policy making circles, that further often encourages presentist thinking and easy and/or quick solutions. This is really a big round of problems facing anyone who is interested into making a positive difference in the world of policy making. This is something that anyone working in this world will encounter, one way or another. On top of this there's another, an additional factor which I think is very important, and which should force us to perhaps reconsider our own position concerning politics and our political systems. I think we as citizens are letting our politicians and political systems down. We are expecting less and less. We are demanding less and less in terms of good outcomes from these systems, and as a consequence we are getting less and less in terms of good outcomes from them. This erosion of trust in our institutions is richly deserved to a degree, but at the same time becoming a self-fulfilling prophecy that is eroding our capacity for national decision making, national politics, and also sensible international politics at the same time. So this is an area of diminishing returns that we have entered into, which is feeding back into this further disillusionment on the part of the population, and also feeding into populist politics which seem to be offering easy sound bites and easy victories for people who are fed up with the business as usual. I will get back to this notion of business as usual in a little while. So what I'm advocating here today is that politics and policy making actually would benefit from interaction and from more participation from individuals like effective altruists. I will make the case in the very final slide why I think this is so, although I'm quite sure that this is not the message that most of you are necessarily very happy or excited about. But you don't have to go all the way in order to make a difference. You can devise different strategies of how to go about making or effecting change in existing policies, if you are interested in affecting this political game and this making of policies on the national or international level. The first strategy I call mix with the animals, and you can think who these animals might be. I think the world is full of opportunities for a person who is interested in effecting change from within the system. In this respect there is good news, because leaders that I've been describing are always on the lookout for the next big idea. They are intellectually curious, and they are looking for solutions to pre-existing problems. They are also looking for new framings of problems and issues, and solutions that they are not yet aware of. So this actually opens up a pretty lucrative and promising market for knowledgeable and talented individuals to come and act as advisors or external consultants to governments. This is a position that I have held over my career and I have found it fruitful and rewarding, and I'm happy to share my experiences later on, perhaps during my office hours. How to go about providing and offering these services, and what is entailed and included in these kind of things. But it is not the only way to go about these things. Another important facet, or group of individuals in policy making that are not policy decision makers per se is the role of civil servants, who play at times a key role in planning and executing policies. There is also the opportunity of becoming one yourself. Think about entering bureaucracies through whatever the national processes might be, or international bureaucracies, there are a lot of those as well, that develop policy responses that have a forward-oriented leaning in their work. Which will give you a lot of opportunities to also produce policy outcomes that you are interested in. But there is an important caveat. 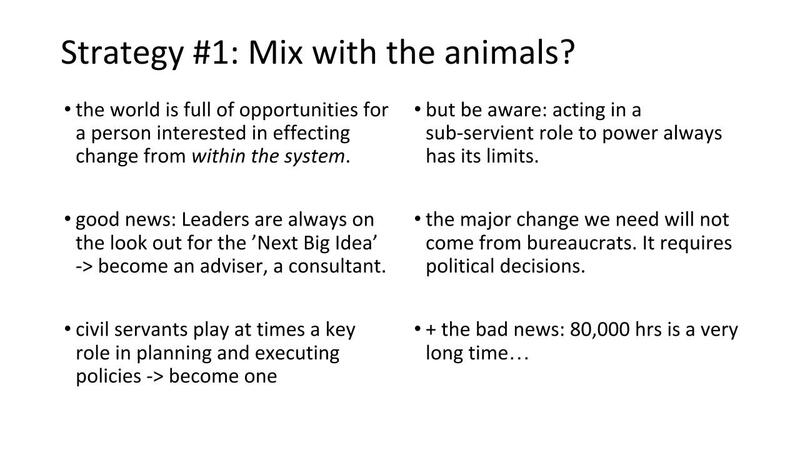 Please be aware that if you play this kind of "mix with the animals" strategy, you are always acting in a subservient role to power. This always has its own limits. Because in the final analysis, the major change we need and the major decisions that will be taken, will not be taken by bureaucrats or advisors or consultants, but they are actually taken by politicians, elected officials, and so on so forth. The leaders who in the final analysis weigh in the different options, different opportunities, and different costs. I say this even though I think this strategy is number one, and it is the one that I have played myself for probably very good reasons. I think I would be an awful politician, to be honest. But I've also come to see the limits of these kind of roles through exercising that kind of power, even at a fairly senior level that I have been working during my own career. The question of seniority is indeed a worthy consideration for young experts and young professionals such as you are, because I think the bad news in following this route is this one: 80,000 hours is a very long time. Climbing the greasy pole of becoming a very effective and very senior civil servant advisor, probably takes a very long time in most cases. This would seem to dictate against the question of time, which I was referring to earlier on. So thinking that we could somehow make the radical change we require take place through this route alone is probably not correct thinking, because we most probably will not have the time to make sure that we have all the right and sensible people in all the right and crucial positions to start making and effecting the change that we need. So although I think this is a worthy route to follow, and it is very important and probably very impactful in many respects, it is probably not sufficient in terms of achieving the kind of change that we need. Which has led me to thinking about this. I would be happy to hear your views about what you make of this one. So the starting point is basically what I have already been saying. It's that the change we need is unlikely to materialize from within the current political structures and the modus operandi. Be it our national political systems or the systems of international governance. I have alluded to the problems already, previously. To my mind the imperative thing that needs to change is our very political culture. Less short-term thinking, more long-term thinking. 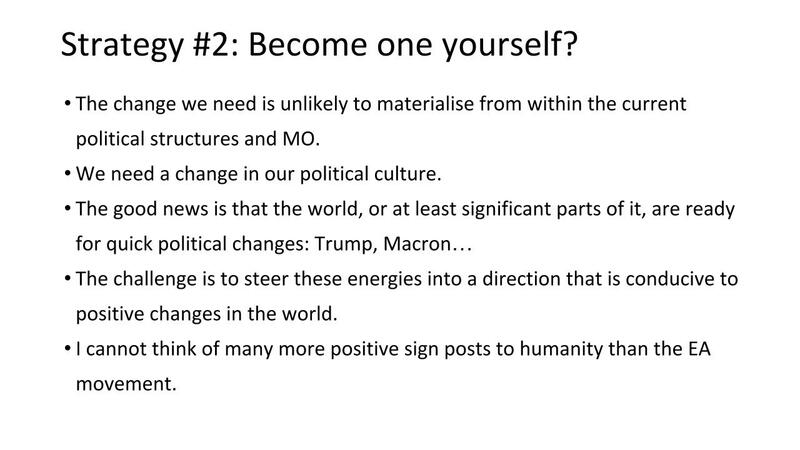 Less egotistical values, nationalism, and narrow-minded thinking, more cosmopolitan thinking, more appreciating and accepting the fact that we are increasingly starting to operate on the level of humanity with our policies and our effects and our unintended consequences without actually having the political institutions necessary to deal with many of these issues yet. Probably not fully being able to build those institutions, at least very quickly or uncontroversially. So we need a change in our political culture, and I think it is a change that can only come from the bottom up because this other system, this existing political culture and our existing political leaders, will most probably not be able to deliver on this kind of change. The good news is that to my mind the world, or at least significant parts of it, are ready for quick political changes. We have seen this for better or for ill. We saw the rapid rise of Mr. Trump from basically from an unelectable candidate to the President of the United States of America, who has been able to take over also the Republican Party. I'm not saying this is a particularly positive or happy example necessarily, but it is an example of how quick political changes are possible in even massively big and well stratified political systems such as the United States. Another probably more hopeful and positive example is the President of France, Macron, who came from similar obscurity very quickly, creating a political platform and sweeping the whole French political system in the process. So I think the potential is there. People are fed up with business as usual. They are looking for alternatives. My concern is that right now many of these alternatives are not coming from a particularly happy or optimistic place. They are coming from xenophobic, populist, narrow-minded circles in many places who want to turn the clock back at exactly the time when we need new thinking, new forms of cooperation, new forms of governance. So not only are they potentially squandering our ability to move forward, they are actually aggressively and very determinedly trying to turn the clock back into the yesteryear. This is clearly something that we simply cannot afford. So what we need is people, new ideas, new movements, that can steer these energies that are there into a direction that is conducive to positive changes in the world. That can articulate aspirational and positive visions that people will want to flock to, vote for, and work for, in order to achieve the change that we need. I simply cannot think of many more positive signposts to humanity than the EA movement. I mean your principles, your thinking, I think is exactly the recipe for the day. This is something that we all, I think, interested in the future well-being of humanity and human beings and the life on this planet, will have to work very hard to project and to help grow, and to get new followers, and to make it an actionable program in our lives and in our political systems. I'm at the end of my time, so it's probably worth clarifying what I'm not proposing here today. 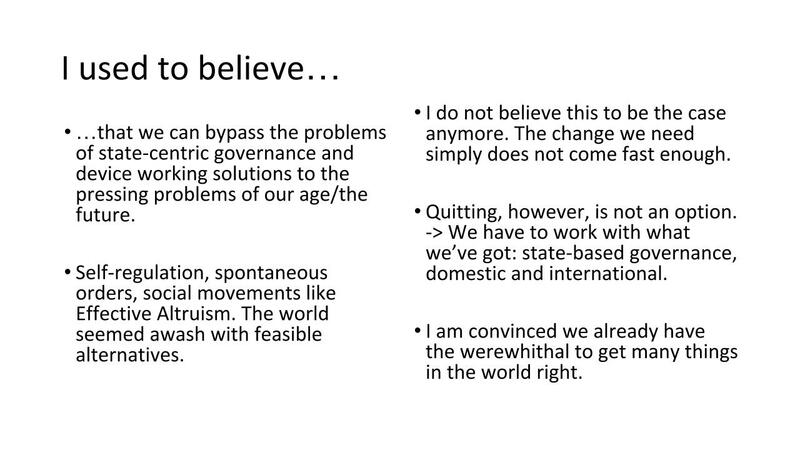 I'm not proposing turning effective altruism into a political movement. I think you are perfect the way you are, and I do not say that you should change in this way and take that kind of route. But I think that effective altruism is a piece of particularly wonderful and exciting software. We have a very robust and very powerful and effective piece of hardware, which is our states, our national bureaucracies, our forms of international governance and so on. So what I would like to see and what I think needs to take place is that this particular piece of software is inserted into this particular piece of hardware. I don't see any a priori mismatch or incompatibility here. No need for hostility or aversion between these two worlds. On the contrary, I think this particular piece of hardware would benefit immensely from interacting much more with the software that you have to offer. 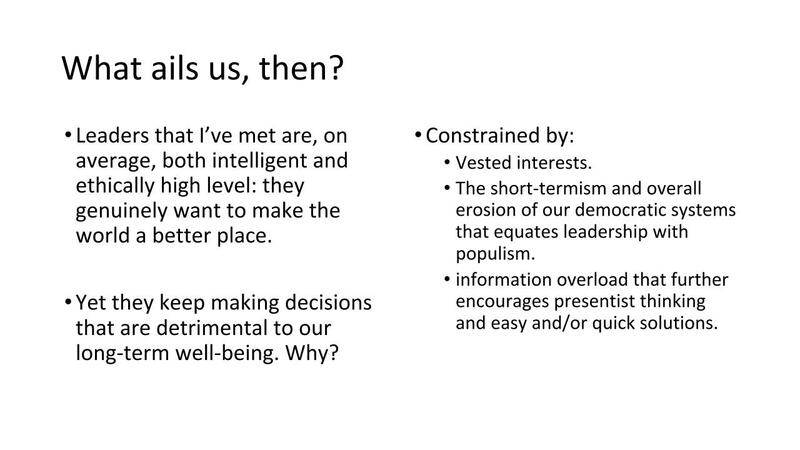 So in order to answer my question how to be more effective in the world of policy making, is that I think some effective altruists, or at least some people leaning into this particular intellectual direction, would have to become politicians, and political leaders, and I think this is called for. So I thank you for your patience, and this invitation. Thank you.